Unlike other studies which often focus just on low-wage workers, the researchers looked at those who also live in low-income households. This way, they were able to strip out the teenager making $8 an hour flipping burgers but still living comfortably with his parents. Or the mom who works a part-time job in retail to supplement her husband's otherwise ample salary. "Increasingly, the people who are low wage workers -- they're not just teenagers or spouses -- they're workers whose families depend on them," Albelda said. Over the last 30 years, the number of all U.S. workers has grown 40%, roughly in line with the adult population. But over that same time period, the number of low-wage workers who also live in low-income households has climbed 94%. These low-income breadwinners now make up roughly 14% of all workers in the country -- the highest share on record since at least the 1980s, when Albelda and Carr started tracking the data. What counts as a low wage? In this study, the dollar figure varied depending on the state, but the median cutoff nationwide was around $11.22 an hour. Common industries for these jobs included restaurants and bars, agricultural production and private households -- like maids and nannies. To count as low-income, households earn no more than double the poverty line -- about $23,000 for a single person or $46,500 for a family of four. Many of these people don't count as "poor" by the official standards, so they don't qualify for government aid. Many also don't fit the traditional stereotypes of the working poor. 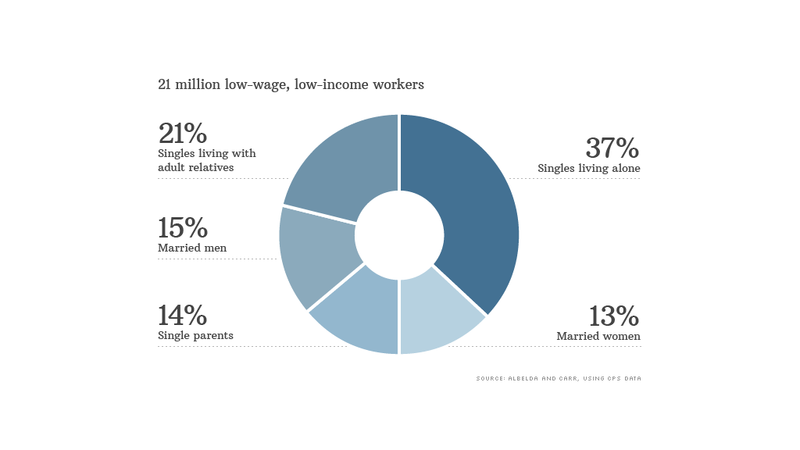 About 15% are married men -- the traditional symbol of a "breadwinner," Albelda said. Another 13% are married women. And about 37% are single men and women who are living alone, without children or other relatives to support. This last group in particular is frequently overlooked, Albelda said. Their jobs often don't offer benefits, but they earn too much to qualify for government aid. Plus, government programs readily direct aid toward low-income single parents, but assistance isn't as readily available to single adults who don't have children, she said. "Being employed but low income is a problem many single mothers face, but as we have shown, it is a growing problem for many other adults," the study said. Single parents made up 14% of the group. The remaining 22% of adults were singles living with adult relatives.